Signs addressing climate change were held up high at "March for Science" Miami in front of Musuem Park. Professor Susan Jacobson from Florida International University holds up sea level rise sign at "March for Science" Miami rally. 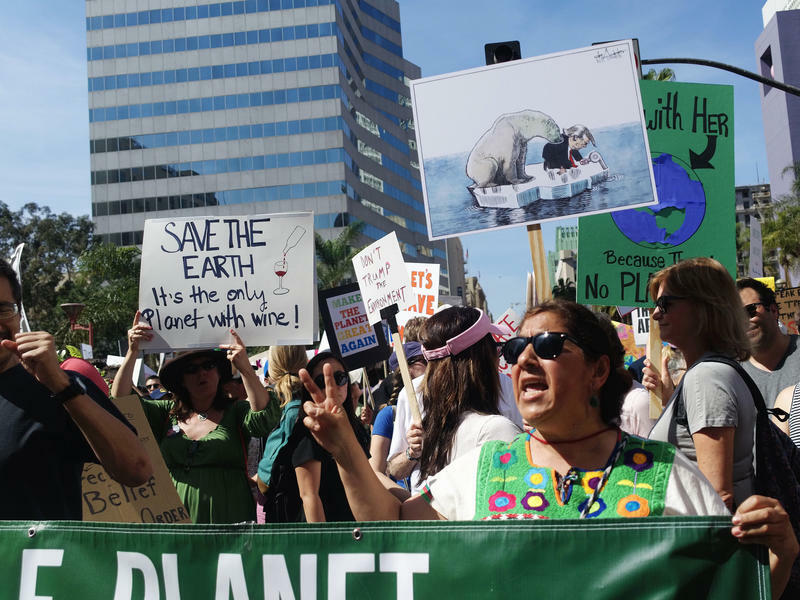 Demonstrators marched from Museum Plaza to The Stephen P. Clark Government Center in downtown Miami, holding up signs addressing climate change and sea level rise. 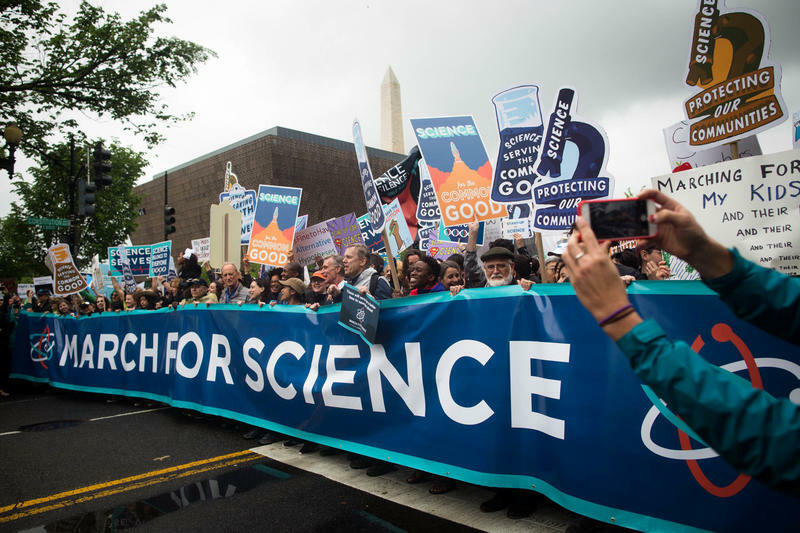 Thousands of scientists and science supporters marched down Biscayne Boulevard in Miami. Demonstrators in Miami’s “March for Science” wearing lab coats. Signs made by demonstrators tackled issues going on in their own backyards - in this case fracking. Paul Laura, Chair of Treasure Coast Democratic Environmental Caucus, dresses as an octupus at "March for Science" Miami. “Two of my heroes are Bill Nye, the Science Guy, and Neil deGrasse Tyson. These men can explain the most complex science in the most beautiful accessible English. We must learn from them. We need to speak like these two men. I told you, everyone of us is a scientist and every scientist is an educator. Let me tell you who else is my hero, Jane Goodall. In 2002 I read an article in Time Magazine and her opening comment was ‘the greatest danger to our future is apathy,’ what I see today is us standing and saying no more apathy. “So the reason I wanted to be here, in D.C., was to show my support for science, but I think also because I work in science and specifically in insect science, I have an understanding of the important role of science and how it touches everybody’s lives. The government funding of science has allowed a lot of discoveries and benefits to happen. Think about the USDA Labs where so much research is done to help human health to prevent diseases. There are various agencies and institutions that are directly affected by the U.S. government that will allow us to have healthy food, access to foods, safe water, and clean air. Specifically related to insects, there are so many reasons that we live enjoyable lives that are not affected by insects that most people don’t think about. One of the things I can tell you about insects, for example in Florida - Florida was populated on the heels of mosquito eradication and more importantly malaria eradication. There’s a reason Florida wasn’t densely populated even 100 years ago and part of it had to do with mosquito disease." Delaney Reynolds, Founder of The Sink or Swim Project and Executive Outreach Coordinator of “March for Science” Miami. “Especially here in Florida, one of the biggest issues we have to tackle is climate change and sea level rise. South Florida specifically is ground zero and we’re already seeing the effects. Three feet of sea level rise is 100 percent going to happen in my lifetime, so now it’s just a fact as to whether or not it’s going to rise upwards of ten feet, which is what we’re working on solving currently. “Science is not a partisan issue, science is a part of our everyday lives. We need science in every aspect, whether it be vaccines, or whether it be technology, we need science to grow to continue to cultivate our society. So, of course, we were going to join in, but then we took a stance asking ‘how about those women in science who are not recognized?’ you see that happening over and over again.